The Charter for the Rotary Club of Cambridge was presented on the 20 September 1946 by PDG Harold Thomas. Harold was the first new Zealander to become President of Rotary International. The club currently has 68 members and welcomes men and women who want to serve their community. Cambridge is known internationally for its many thoroughbred farms that produce champion race horses, for it's world class velodrome and cycling centre, and as the home of the Lake Karapiro rowing centre which has produced many gold-silver-bronze medalist Olympians and world rowing champions. This is Cambridge’s version of Who’s Who and What’s What. 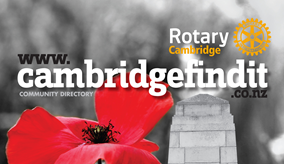 An annual publication, first produced as a club project 1990, the directory has raised in excess of $1 Million for distribution to the Cambridge Community by way of grants. A small team of Rotarians work throughout the year to ensure that a high quality and useful directory is produced. All members team up to distribute the publication to every household and business in the area. 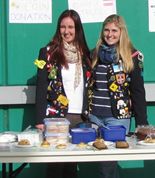 The Club has participated fully in this international scheme for over thirty years with both incoming and outgoing students. Students are selected to go to another country for their final year of secondary education, and are hosted by three or four families organised by the local Rotary club gaining invaluable knowledge of their host country. The club also participates periodically in the Twin Exchange programme between Australia and New Zealand for younger students. 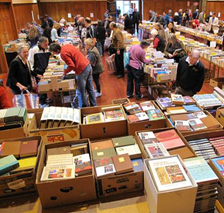 This annual project, which began in 1996, involves all club members, from the circulation of advertising flyers throughout the town, the collection and sorting of donated books into categories at a central location and the four day sale in the Cambridge Town Hall early October each year. The Trust is the vehicle we use for our major fundraising projects and the distribution of the resultant funds raised. Combined earnings from Bookerama and Find-It Directory have totalled over $75,000 resulting in grants being made to 18 different organisations ranging from $500 to $10,000.